Tron is continuing its bullishness for past 4 trading days and jumped almost more than 40%. It has surpass IOTA in market cap and reached the 9th spot. Overall the pair jumped almost 350% from the low of 0.02280. Justin Sun in a recent Huobi conference in Korea mentioned about “secret announcement” he will make in June post Main Net launch. It is expected that once Tron is launches own Main Net , the plat form will see an increase in the number of developers launching Dapp. The launch date of main net advanced from Jul 1st to May 31st .In anticipation of the launch market expects TRON price to move upward till May 31st 2018.The Main net launch has seen lot of supporters joining TRON, including 8 large crypto exchanges. There are lot speculations going around discussing the probability of Alibaba becoming next partner with TRON. 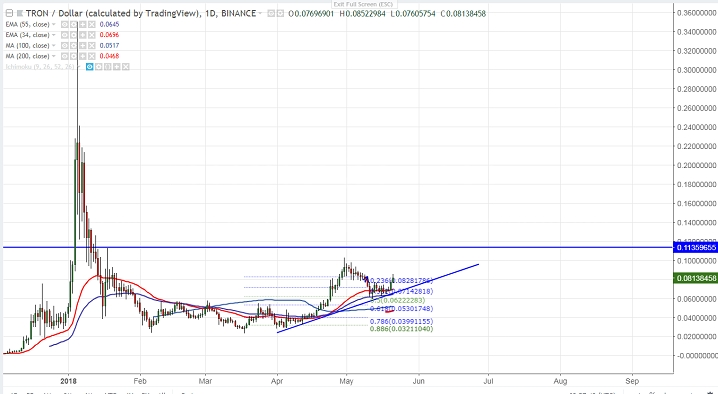 Technically, Tron has taken support near trend line and shown a minor jump from that level. Any convincing break below 0.0600 (trend line support) will take to next level till 0.053/0.0700. On the higher side, any break above minor resistance at 0.08600 will take the pair till 0.09300/0.100/0.15. It is good to buy on dips around 0.00740-45 with SL around 0.053 for the TP of 0.15/0.35/0.50.